Hi there, thanks for popping into my blog. 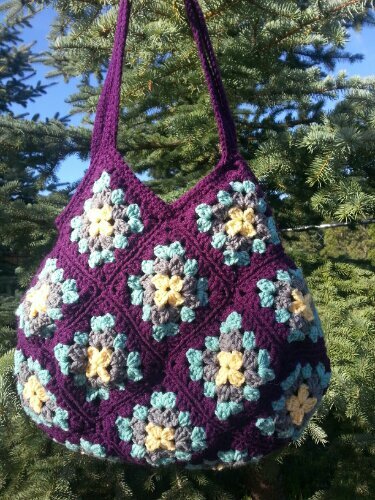 A friend of mine recommended I stitch some squares (I posted a picture of them somewhere – I think I might have titled it ‘crochet bag’) together to make a bag like this but I’m not sure how to do it. Did you follow some instructions from somewhere that I could use or did you just work it out yourself? Either way, any tips would be appreciated. Thanks, it’s such a lovely shape and 22 squares doesn’t sound like too many. 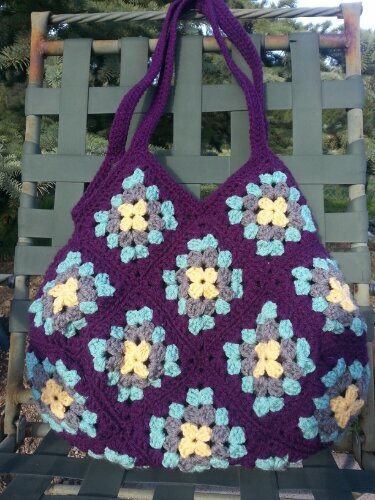 I join by sc in the back loop,,, this creates a ridge on the wrong side of the bag,,, which will be the inside… I lay it all out then crochet rows of them together… there is a great picture tutorial of this at Attic 24.. Here is the link http://attic24.typepad.com/weblog/joining-granny-sqaures.html. Thanks for popping over to my sight too!